Quinton, known as V in the Japanese version, Five in the Italian version, born Christopher Arclight and called Chris for short, is the eldest son of the Vetrix Family and was the most dedicated towards their cause. 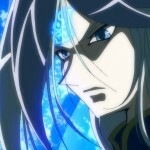 While his younger brothers, Trey and Quattro, have a crest on their hands; Quinton’s crest is blue and on his forehead. 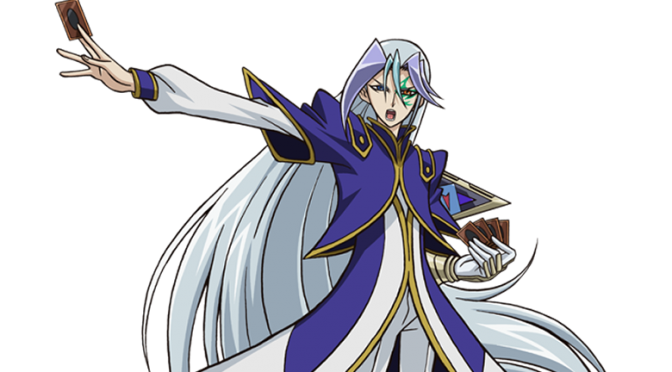 He has blue eyes and long, flowing silver hair with light purple fringes and one light green in the middle. Quinton tends to wear quite long and dark clothes, which fits in with his hair. While Trey and Quattro wear the same footwear, he doesn’t, maybe highlighting how he is the eldest. Like his brothers, he has a Duel Gazer tattoo, which is green. Quinton’s D-Pad is two golden triangles separated by a layered infinity symbol, with the Roman numerals V on one side and IX on the other, which represent his name and his “Number” card, “Number 9: Dyson Sphere”, respectively. As the eldest brother of the Vetrix Family, Quinton is the most rational and calmest of his brothers, even more so than Vetrix at times. When he was younger, Quinton was gentle and mature to others, looking out for his younger brothers and made sure they behaved. After learning of his father’s fate, Quinton became cold and stoic, blaming his father’s condition on Dr. Faker. Assisting with Vetrix’s revenge, Quinton kept his brothers in line and was usually shown with his father conversing over important issues. Quinton means “fifth, the fifth, fifth child” in Latin. Quinton’s crest grants him various powers. It allows him to take control of others. He is also able to perform telekinesis. His crest comes with a price – it is directly connected to his soul; therefore, should he lose a Duel while wielding a powerful “Number”, his soul will become exhausted and he will fall comatose. 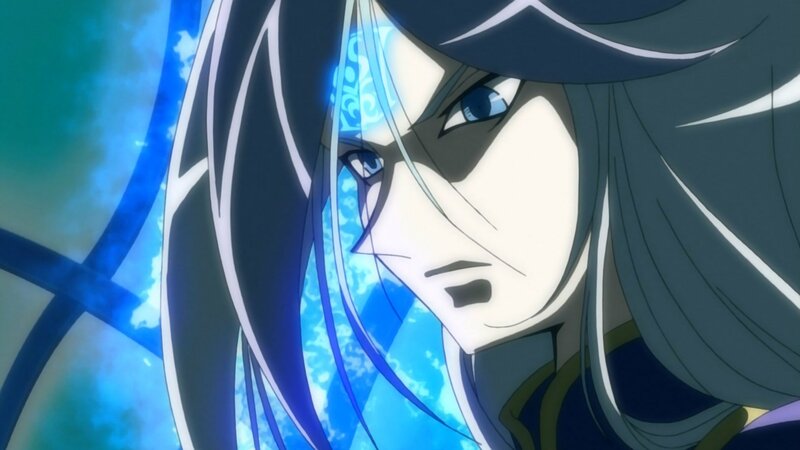 Like his brothers, he also has one of the bracelets that he invented, which granted him their father’s crest abilities. Also like his brothers, he suffers pain from the device when Summoning Number C9: Chaos Dyson Sphere. Quinton uses a Space Deck, primarily focused on Xyz Summoning “Number 9: Dyson Sphere”. Given its hard-to-access Rank, Quinton uses cards such as “Deep-Space Cruiser IX” and “Tannhauser Gate” to easily acquire appropriate Overlay Units for it. 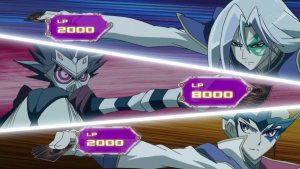 He also uses several cards to punish the opponent’s attacking monsters while also inflicting effect damage, such as “Neverending Nightmare” and “Punishing Fire”. 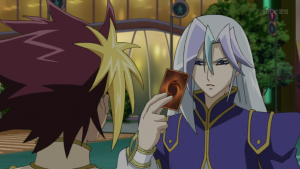 During his Duel with Mizar, Quinton incorporates “Rank-Up-Magic Argent Chaos Force” into his Deck, giving him access to “Number C9: Chaos Dyson Sphere”. In order to counter the new-found power of the Barian Emperors (“Rank-Up-Magic – The Seventh One”), he includes “Spell Summon Stopper”.